Hey lovelies, I am super excited to share this product with you guys. I've never done a product review before but this stuff is just that good that it would be a real disservice if I kept it to myself. With the onset of summer here in Abu Dhabi, I realized that the more commercial brands of antiperspirants and deodorants just weren't giving me the level of freshness I needed. Yeah, no. That wasn't going to work for me. Obviously deciding to switch things up in the middle of desert weather wasn't an easy or simple undertaking. I needed lots of different options and trial testing and that sort of stuff. Only problem was, I didn't have any other options available to me here. I had no clue where to look. Serendipitously I came across the Kiehl's store while at the Dubai Mall and went in to check it out. While browsing all the goodies on display I found the Superbly Efficient Antiperspirant and Deoderant Cream. Yes please! Until I saw the price. Womp womp. Hashtag sad face. The price tag was kinda hefty for some under arm cream and even though the sales guy tried to convince of its awesomeness, I wasn't sold. It was almost twenty five bucks for the small tube. So I left the store without it. But after mulling it over for a bit, I decided to go back and get it. I've definitely spent far more money on crap so if this didn't work I'd just add it to the list of previous casualties. Happy I decided not to be cheap that day. It's been nearly a week of using it and I am really impressed. Granted I haven't tested it out to see how it holds up for a gym session but it's done a superb job getting me through the hot days. I don't smell orange or lemon but that's not a bad thing. The scent is very delicate and mild. 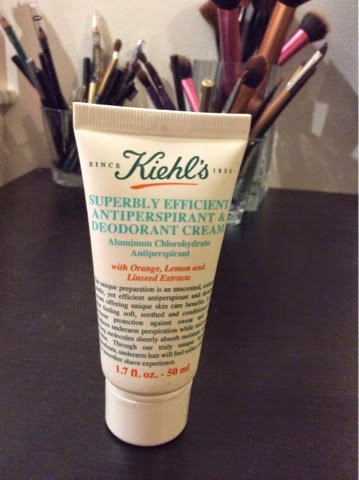 It has a cream like consistency and you can apply it directly from the tube to your pits. It's not messy and you can control how much you use. It does take some time to fully absorb but I haven't noticed any residue on my clothing. I totally hate those white deodorant streaks on my shirts. Definitely go get this superbly awesome product. It works. I did a 5 minute trek from my house to Starucks (felt more like 20) in the blazing sun and and humidity and still smelled fresh and clean. Winning! I'm not being paid or compensated in any way to write this review. I'm doing it just cause I really do love this stuff and all my coworkers can attest to my adoration for the cream because I announce it to them every day after completing several smell checks through out the day, for research purposes of course.